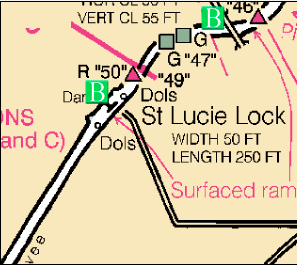 Franklin Lock, westernmost lock on the Okeechobee Waterway, is located at Statute Mile 121 and St. Lucie Lock, the easternmost lock, lies west of Stuart, FL near Statute Mile 15. This notice was posted on AGLCA’s Forum by good friends Chuck Baier and Susan Landry. The U.S. Army Corps of Engineers, Jacksonville District has announced restrictions for lock operations on the Okeechobee Waterway due to receding water levels on Lake Okeechobee, effective immediately. Lake Okeechobee falling below 12.5 feet. Under the updated schedule, boats will be locked through at the Franklin and St. Lucie Locks at 7 a.m., 9 a.m., 11 a.m., 1 p.m., 3 p.m., and 4:30 p.m. Operations at the other three locks, Ortona, Moore Haven, and Port Mayaca, will continue on demand between 7 a.m. and 5 p.m. with final lockage beginning at 4:30 p.m.
How do you find the lock information?? ?